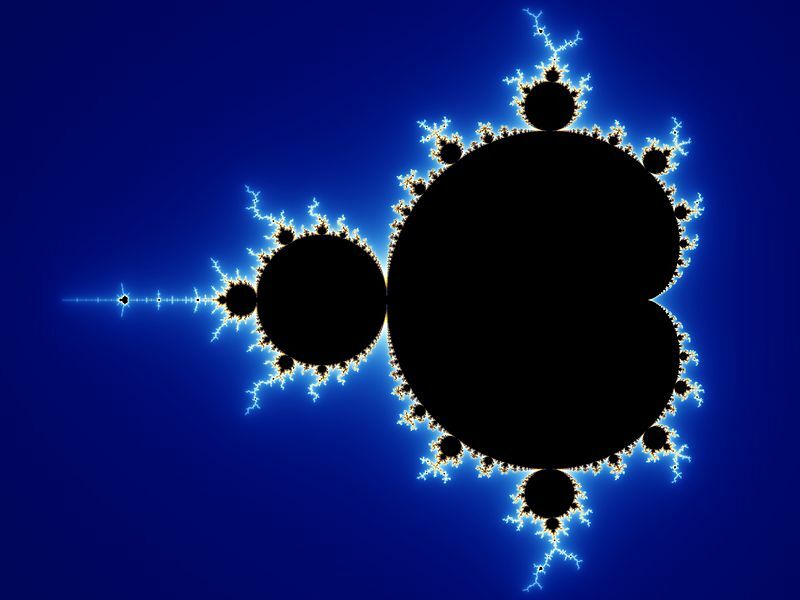 Photo: the visual representation of the Mandelbrot set, one of the most famous fractal images of all time. Click here for a short video of what we see as we zoom in on the set. In The Fractal Geometry of Nature, mathematician Benoit Mandelbrot (1982) defines a fractal as “a rough or fragmented geometric shape that can be split into parts, each of which is (at least approximately) a reduced-size copy of the whole.” In other words, fractals are self-similar shapes. Picture, for example, a triangle made up of infinite triangles which, if you zoom in on it, you find to contain more and more triangles, no matter how far you look into it. In a more familiar example, a tree has a fractal structure; if you look at the tree as a whole, you see that it branches out from its trunk into main branches. If you look at a main branch of the tree, you see proportional branchings. You even see similar forms if you look at branches on the main branch, sub-branches on those branches, and even at the structure of particular leaves. A fractal is a pattern made up of shapes that are self-similar like this tree; whether you zoom out, or zoom in on it, you find more and more of the same shapes. Fractals are not a mere mathematical curiosity, however. Fractal geometry captures the complex forms of the natural world that classical Euclidean geometry, with its perfectly smooth lines, could not. Bumpiness and roughness and apparent chaos are all amazingly suited to the language of fractals. Fractal geometry provides scientists with one of the most powerful tools for modelling the structures and shapes of the universe that human beings have ever discovered. As you will see, not only is your whole universe made of fractals, but so are you. 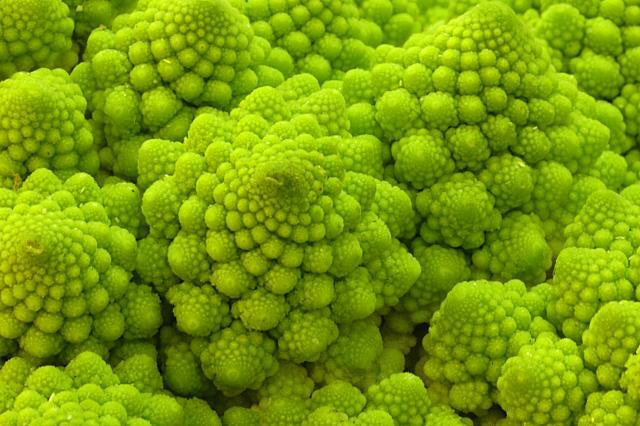 Photo: Romanesco brocolli, like a tree, has a fractal structure. In a striking example of the pervasiveness of fractals in nature, Ernest, Enquist and their other collaborators (2003) found that the the distribution of branch lengths within a single tree closely matches the distribution of tree heights within the forest as a whole. In other words, not only is the structure of a single tree fractallic, but so is the structure of the whole forest in which that tree is found; a forest is a fractal made up of fractal trees. Ernest and Enquist (2003) used this finding to make predictions about the amount of CO2 a forest could absorb. Extrapolating from the amount of CO2 that a single leaf could absorb, they used fractal equations to arrive at a proportional value for how much a tree could absorb. Scaling this data up (for taller trees) and down (for shorter trees), and keeping in mind the proportional link between the distribution of branch lengths in the tree and tree heights in the forest, they were able to arrive at a prediction for the amount of CO2 that the forest in which that tree was found could absorb. From studying a single tree, they arrived at information about the whole forest; by studying a part, they arrived at conclusions about the whole. This is the amazing power of fractals in action. Photo: Trees are fractals, self-similar shapes. Fractal patterns are the most efficient shapes for compressing extremely long and winding lines (e.g. molecular sequences, or folds in the brain, or pathways in the body’s network of capillaries, veins, and arteries) into extremely small spaces. They are thus the most efficient shapes for compressing complex systems of organs and pathways between organs into the small spaces of the bodies of particular organisms. As a result, natural selection has favoured them in the evolution of every known organism in the tree of life. Fractals are nature’s ultimate packing strategy. The rules for producing extremely complex morphological systems—that is, systems of shapes or forms—can be extremely simple if they are fractallic—as are all of the physiological systems within the human body, for instance—and thus be encoded in the genetic code in the most efficient manner possible. Moreover, the ‘rhythms’ of fractals are found not only in the shapes of our bodily systems, but also in their functions; human heart beats as a function of time, for instance, map out a fractallic graph. Fractal patterns have driven the evolution of more complex structures out of simpler ones and of the evolution of all of the amazing species that we find in the diverse ecosystems of planet Earth. As it turns out, the efficiency of fractals has not only favoured the formation of fractal shapes within the bodies of living organisms, but also in the nonliving structures of our planet, and even the universe as a whole. Weather patterns are fractallic. The structure of coastlines is fractallic. The movements of clouds are fractallic. The structures of mountains are fractallic. The patternings of gas clouds in nebulae are fractallic. Networks of rivers are fractallic. The structures of galaxies are largely fractallic. In short, fractals are the pervasive and universal shapes, the fundamental geometric ‘words’ out of which the Book of Nature, as Galileo put it, is written. Photo: The networks of capillaries and arteries within our bodies (as in the lungs, shown here) are fractals. Photo: Antennae that are bent into fractal shapes can be compressed into small spaces and receive a wide range of frequencies. Beyond cell phones, many computers now integrate fractal shapes into their hardware systems because of their space efficiency or ability to compress complex networks of winding lines into tiny spaces. How appropriate it is that the very shapes on which our life and our bodily systems depend also play a critical role in the workings of our cell phones and computers, the basic ‘organs’ of our modern, technology-driven lives. In closing, we live in a great and majestic universe, and as scientists continue to discover, this majestic universe is also a fractal universe. We are fractal beings moving along fractal patterns on a fractal planet in a fractal galaxy within a fractal universe. Self-similarity recurs at all levels of physical reality. As we contemplate the pervasiveness of fractal beauty and the universal power of simplicity woven into complexity, we cannot help but be baffled and amazed. Words fail us and we are overcome with a great and unspeakable awe. And even while we find ourselves temporarily breathless, billions upon billions of fractals continue to keep us alive, both within our bodily systems, and outside them, in the environmental systems that drive and sustain our planet. The pulse of life beats along fractal lines. 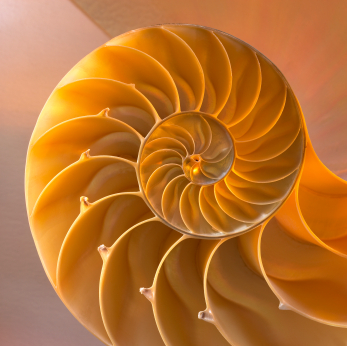 Photo: Fractals can even be found inside the beautiful structures of some sea shells. Ernest S.K.M., Enquist B.J., Brown J.H., Charnov E.L., Gillooly J.F., Savage V.M., White E.P., Smith F.A., Hadly E.A., Haskell J.P., Lyons S.K., Maurer B.A., Niklas K.J. & Tiffney B. (2003). “Thermodynamic and metabolic effects on the scaling of production and population energy use”. Ecology Letters 6 (11): 990–5. Mandelbrot, B. B. The Fractal Geometry of Nature. New York: W. H. Freeman and Co., 1982. West, G.B., Brown, J.H., & Enquist, B.J. (1999). “The fourth dimension of life: Fractal geometry and allometric scaling of organisms”. Science 284 (5420): 1677–9. Yes! Formlessness expressing as form, depths within depths within depths. Holyfractalgraphic wonder Batman! A hologram that is fractallic, and my system, our living system planet-wide is an interwoven holyfractalgraphic antenna receiving the intelligent loving creative life force impulse pulsing throughout the universe! Relax and enjoy the show while Being in the know! Thanks for this, great articulation.